After a warm still start to the morning, it has fast become a blustery day worthy of A. A. Milne. These are the trickster winds of spring that we were promised, and they have grown to full gale force over the course of the morning — bringing no more than a few scattered raindrops thus far, but delivering a bone-deep wind chill and the apparent promise of snow arriving late. Coyote made a brief incursion onto the land yesterday (before the half-feral dogs chased him beyond our bounds), so perhaps such drastic and capricious change was always inevitable. The word “nostalgia” implies remembrance of things far in the past, but already we find ourselves longing for the warmer winds that blew through here yesterday. Today’s featured work embodies two of the spirits of those winds, neither of them remotely tricksters. We have some of their kind here already — indeed, they are with us permanently — but the others are seasonal, and it is still too cold for them to appear. Too cold . . . in theory. I still maintain that I heard the telltale hum of a hummingbird’s wings some eleven days ago. The Dawn Horse and the Night Bird are spirits of air and sky, medicine beings here to guide us and protect us on the path throughout our days. Wings summons both spirits onto a miniature medicine shield: a big, bold, beautiful necklace that is wearable art and protective amulet simultaneously. The shield is cut freehand from sterling silver of a substantial gauge, arcing to follow the shape of the sky. Across the center between two hand-stamped Morning Stars races the Dawn Horse, an Indian paint pony stretched in full gallop, his spirited tail flying free behind him. 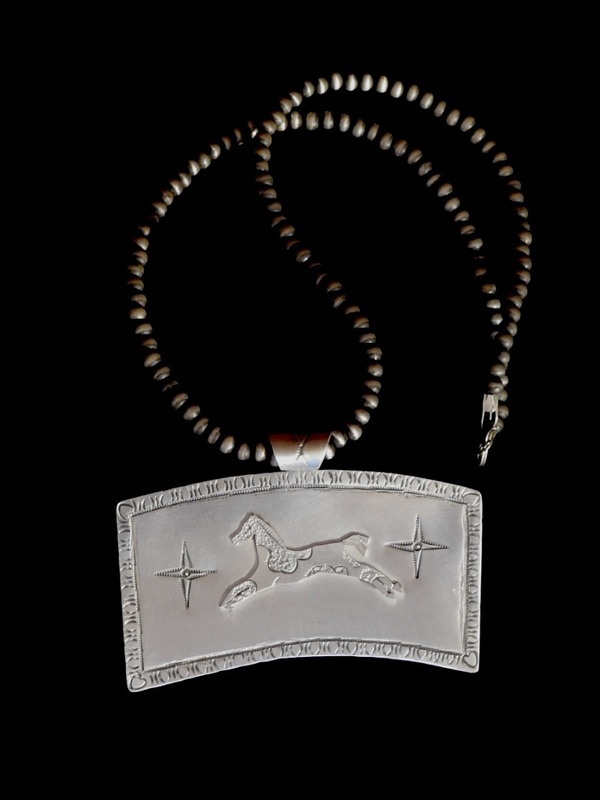 The horse is cut freehand of sterling silver, hand-stamped to delineate features and pinto coat, then overlaid securely. Blossoms edge the perimeter like rays of morning light, with a single hand-stamped in each corner. On the reverse, the Night Bird, of the Hummingbird Clan, hovers in mid-air to drink from a night-blooming flower. 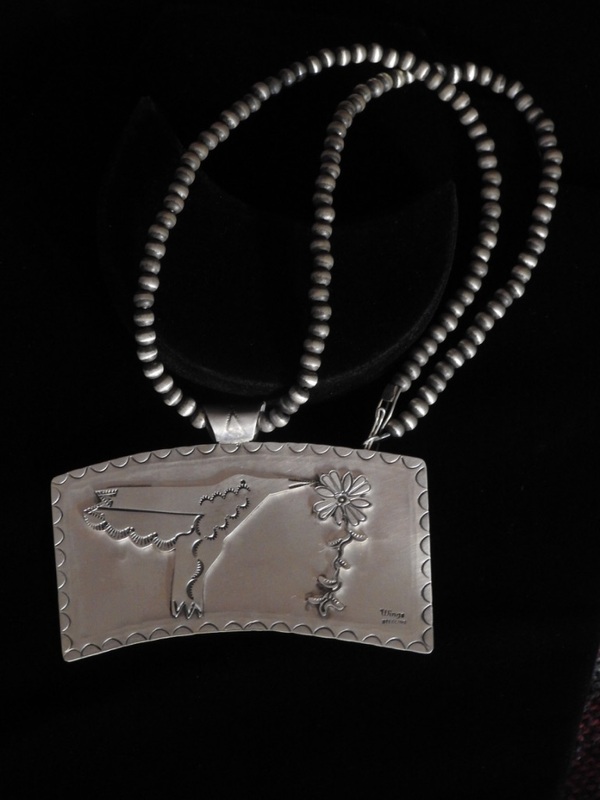 Hummingbird and flower are both cut freehand from sterling silver; the little bird’s bill, features, and feathers are brought into focus via hand stampwork, the flower’s delicate petals, vine-like stalk, and tiny leaves are cut freehand of a single piece, hand-stamped, and overlaid opposite the hummingbird. The shield’s reverse is edged on all sides with hand-stamped crescent moons, signifying the glow of night. Atop the shield is a hand-wrought bail hand-stamped in a simple directional-arrow design. The pendant hangs suspended from a glowing strand of sterling silver beads burnished to an aged patina. Pendant hangs 2.5″ long from top of bail to center bottom of shield; ends of shield are 1-7/8″ long; pendant is 3.5″ across; beads are 20″ long (dimensions approximate). Reverse of full necklace, plus close-up views of front and reverse of pendant, shown above and at the link. This piece is unusual compared to Wings’s more customary necklace designs, in that it contains no stones — pure silver, burnished with a softly aged patina. In this instance, the adornment consists purely of Wings’s own artistry, twinned overlays, front and back, wrought wholly freehand, set in the embrace of freehand stampwork. It’s a powerful simplicity that contributes to a spare and elegant whole, one that embodies the powers of these free spirits of the winds. Now, as the sun emerges only momentarily from a day gone increasingly gray, our world outside the window glows with the same burnished look of aged silver, as though the blustery winds and the storm hovering just at the horizon have conspired with the sun to summon these spirits into tangible form. The horses are here already, at dawn and throughout the day and night. Soon enough, the hummingbirds will be here to stay, too. Posted on Wednesday, April 10th, 2019 at 1:03 pm. Filed under: The NDN Silver Blog Tags: The NDN Silver Blog	RSS 2.0 feed.